We know next to nothing about it, and the Pluto probe New Horizons is headed straight for it. You might not have heard of MU69, but it's about to be really famous — and you can give it a better name. The spacecraft New Horizons is on its way to another close encounter, with a mysterious object we have barely glimpsed. The target is in the heart of the Kuiper Belt — the fringe of debris beyond our solar system's familiar planets. We know next to nothing about this rock and at the moment, it doesn't even have a good name. Based on how it was first spotted, by the Hubble Space Telescope, the object currently goes by (486958) 2014 MU69 — or MU69 for short. Today NASA has launched a public naming competition, offering anyone around the world the chance to christen the most distant object ever explored. Entries close on December 1 and the winner will be announced in January. "It's only got a license plate so far," Alan Stern said. "We'll fix that." Dr Stern is the principal investigator of New Horizons, the little NASA probe that shot past Pluto in 2015 and completely upended our expectations of dwarf planets. The spacecraft already has six billion kilometres on the clock and is now more than halfway to MU69, where it will arrive on New Year's Day 2019. "You've gotta really love delayed gratification on this mission," Dr Stern said. Even from the little we do know about it, MU69 is an intriguing destination. For starters, as targets go, it's not a big one. Whereas Pluto is about half the size of Australia, this thing would just about fit inside Canberra. "[It's] only about 30 kilometres across," Dr Stern said. "No-one's ever been to a world like this. It's about 1,000 times the mass of a typical comet and about 10,000 times less massive than Pluto." So far, our best information comes from chasing its faint shadow across the Earth with mobile telescopes, including SOFIA: an infrared telescope mounted on an aeroplane. "It's a very powerful technique where we can watch the target, MU69, pass in front of a star and make it wink out," Dr Stern explains. "And from the amount of time that it winks out, you can tell how big it is … and if you watch it wink out from multiple telescopes, in slightly different places with multiple lines of sight, you can trace out its shape." A recent series of observations just like this, from SOFIA and a string of carefully positioned, portable telescopes in Argentina, delivered a big surprise: it's actually two objects. "MU69 appears to be a binary," said Dr Stern, with obvious excitement. "The two may be touching, or they may be orbiting each other. We'll have to wait for the flyby to really know. "We will have spectacular imagery because we'll be going even closer than we went to Pluto." A mid-sized, far-flung object like MU69 is completely uncharted territory — and it also serves as a trip back in time. It is a frozen remnant, Dr Stern explains, from our solar system's chaotic younger years. "There's a conventional notion that rocks run into each other and build boulders, boulders run into each other and build comets, and comets run into each other and make MU69s, and eventually MU69s accrete to Plutos and planets," Dr Stern explains. "It's massive enough that it probably had active surface geology at some point in its past. "But we've never been to something of that size, that's been in this deep freeze all along. "We're just going to have to see." Just like its Pluto visit, New Horizons' encounter with MU69 will be fleeting: a straight-line flyby at about 15km per second. When you're travelling that fast there's a limit to how much you can steer. "We're travelling on a one-way exit of the solar system," Dr Stern said. "New Horizons is a very sophisticated machine, but it's not the Millennium Falcon." Even the decision to visit MU69 was made because it was achievable with minor adjustments. "We only have a little bit of fuel on board, that allows us to target new flybys if we find something interesting. Or we can use it with our control jets, just to point our telescopes," Dr Stern said. 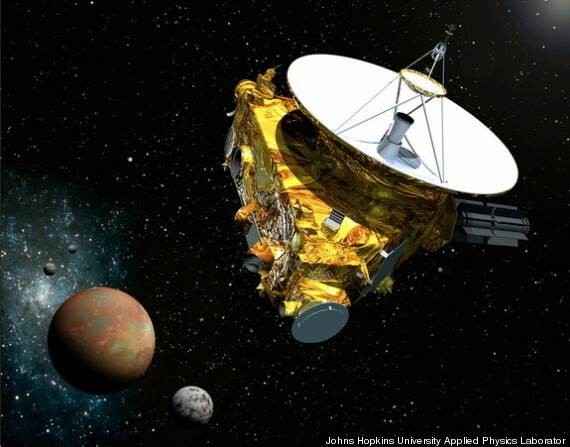 As it soars towards the edge of the solar system, New Horizons is essentially a remote lab. Very, very remote. And its systems, although they date from 2006 — those hazy pre-iPhone days when the probe was sent into space — are in rude health. Its antenna can still drip-feed data back to Earth at about the speed of a dial-up modem. "We use our telescopes all the time, to study other Kuiper Belt objects that we pass by in the distance," Dr Stern said. "We're making observations that you can't make from the Earth, you can't make from the Hubble – because we're there." He said there is enough fuel in the tanks, and enough juice in the small plutonium-powered generator, for the craft to keep operating way into the 2030s — provided his team can secure the funding to keep driving it. In the meantime, they have historic successes to look back on. Regardless of whether Pluto is a planet, it's an extraordinary place. And almost everything we know about it comes from New Horizons. When the craft hurtled past in July 2015, snapping our first ever close-ups of the dwarf world and its multiple moons, planet Earth paid attention. "There was just this viral societal response," Dr Stern recalls. "It had been a generation since we'd gone to someplace new. "For a lot of people, like my kids — they weren't born last time we did this … and they went crazy for it. It was awesome." To add to the novelty, Pluto has yielded a list of discoveries that reads like a catalogue for a science fiction set-builder: ice volcanoes, nitrogen glaciers, towering mountains and avalanches, clouds and hazy weather patterns — and of course, a heart-shaped plateau. "It's as active as [any world] we've ever seen," Dr Stern said. "We've seen frozen, dead worlds that died billions of years ago … and we've seen worlds that have gone haywire, like Mars and Venus, that can teach us about climate change and how we'd better take it seriously. "But then we went to Pluto and we were just stunned, that a little place so far away and so cold — just 40 degrees above absolute zero — could be so active, so long after its birth, and on such a massive scale. "We're still scratching our heads." And he hopes that the scientific head-scratching, as well as the public's enthusiasm, will reach another crescendo as MU69 spins into view at the end of 2018. "Everyone can come along," Dr Stern said. "Spend your New Year's Eve with NASA — your Christmas in the Kuiper Belt." In the intervening 14 months, New Horizons has another half-a-billion kilometres to travel. It certainly puts a trip home for the festive season into perspective.